Your backyard birds are counting on you to keep them going through the winter. Keeping their body temperatures high enough to survive the cold is a battle for birds, and they face a constant struggle for food, water and warmth throughout the season. You can do a few simple things to help your favorite backyard birds get what they need..and they will provide you with lots of close up opportunities to watch them! WATER: Providing a fresh clean open water source is perhaps the most important thing you can do for birds in the winter. Backyard birds like to drink, bathe and socialize at birdbaths. Clean feathers are great insulation and in cold weather, birds need to have well maintained feathers to retain their normal body temperature. Plus, in the cold, birds easily dehydrate and are constantly looking for fresh open water that isn’t frozen over. Heated birdbaths are very popular with birds! Most heated bird baths will require electricity, so make sure you use a grounded extension cord. You can also purchase solar heated bird baths and birdbaths that have the heating element already built into them. Keeping several fresh water sources will increase the variety of birds. And you may discover your birdbath with available water is the most popular place around. SAFE HAVEN: As we enjoy the warmth of the holiday season inside, don’t forget that wild birds also need shelter and warmth. A brush pile made from old logs and branches is a great escape from the elements and a safe place from predators. Raking leaves under hedgerows also help create habitat for birds such as towhees, sparrows and thrashers. The leaf mulch will help protect ground cover and provide a food source for bug-seeking species. 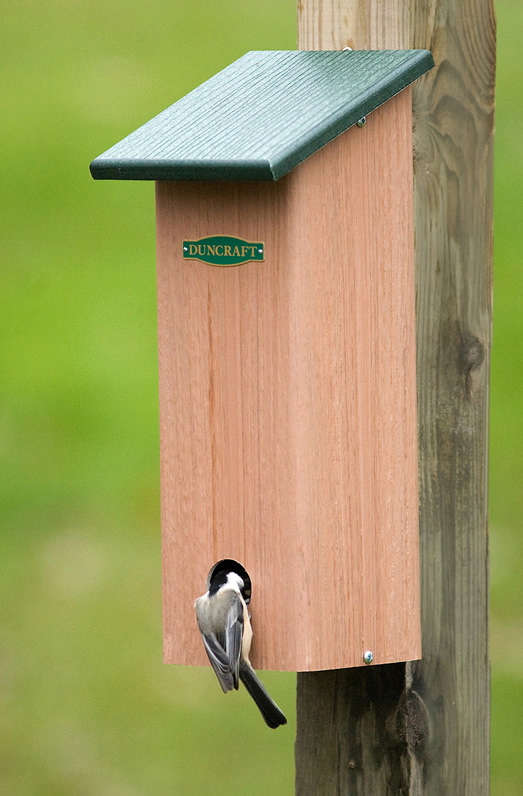 You can also make or buy roost pouches or boxes that will give birds a safe, warm place to spend the night. Roost boxes look a little like a nestbox, but they have perches inside so a number of birds can huddle together and keep warm on cold nights. You can also clean out old nest boxes, as many birds will use them as night roosts as well. FOOD: If you didn’t clean your feeders before the cold weather hit, wait for a day above freezing and take down your feeders to give them a good winter cleaning. Wearing gloves, you can use a 9:1 diluted water and bleach solution (9 parts water with 1 part bleach) with a bottlebrush to scrub your feeders. After cleaning, rinse them VERY thoroughly and allow them to dry completely. Give them at least a few days to allow the bleach to break down so the feeders are safe for your birds. It is important to clean your feeders like this throughout the year so they don’t enable transmission of disease between birds at your feeders. Another good tip is to clean up the hulls of seeds from underneath your feeders as they may also be unhealthy. And then…fill up those feeders and suet hangers and watch the show! 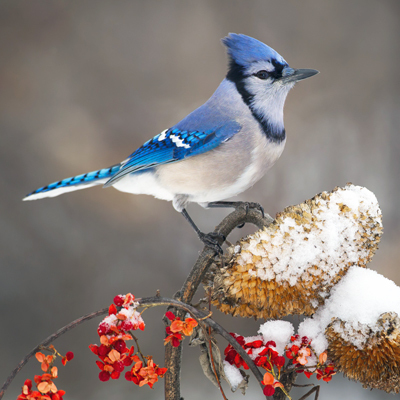 NATURAL WINTER GOODIES: Keeping your feeders full is great, but fruit-bearing trees and shrubs will provide food and cover all year long. Plants such as hollies, dogwoods, oak trees and cherry trees, will provide significant berries on which birds can feed. And they provide much needed shelter from the elements and predators. If you got the message in our early fall newsletter and did some planting, you may have now some over wintering berries and nuts which birds will appreciate in the hardest days. If you didn’t, make a note to plant for birds in the springtime! Backyard birds need all the help they can get in the winter and just these few simple things will help make their winter a bit more bearable.